There Were Fewer Black Men In Medical School In 2014 Than In 1978 : Shots - Health News Medical school applications have gone way up in the past few decades. But one group of applicants has not grown: black men. Jeffrey Okonye (left) and Oviea Akpotaire are fourth-year medical students at the University of Texas Southwestern. Oviea Akpotaire and Jeffrey Okonye put in long days working with patients at the veterans' hospital in south Dallas as fourth-year medical students at the University of Texas Southwestern. 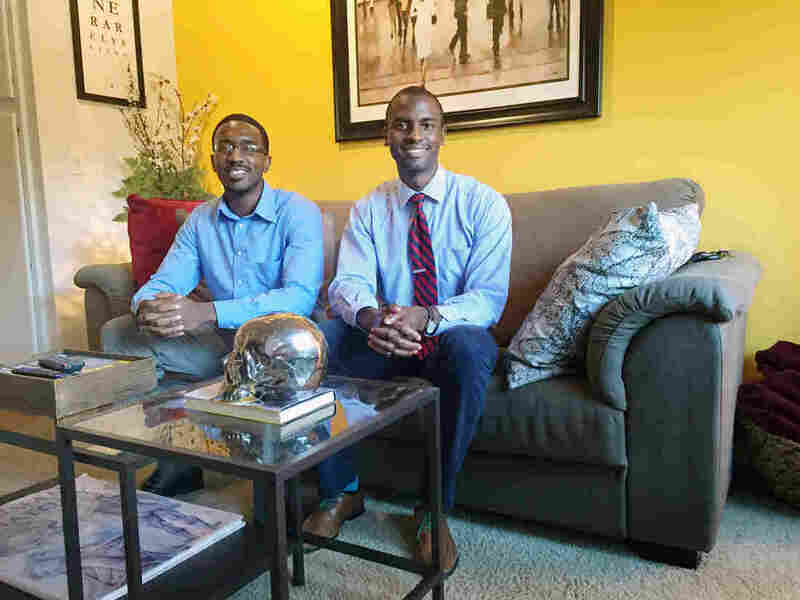 They're in a class of 237 people and they're two of only five black men in their class. "I knew the ones above us, below us," Okonye says. "We all kind of know each other. It's comforting to see another person that looks like you." While more black men graduated from college over the past few decades, the number of black men applying to medical school has dropped. In 1978, 1,410 black men applied to medical school and 542 ended up enrolling. In 2014, both those numbers were down — 1,337 applied and 515 enrolled. Those figures come from a report from the Association of American Medical Colleges. Every other minority group — including Asians and Hispanics — saw growth in applicants. There was also an uptick in applications by black women. Enrollment statistics for 2015 are just out and they show a modest gain of 8 percent more black men entering medical school over the year before. "This is a positive sign," says Marc Nivet, AAMC's chief diversity officer, "but it does not change the fact that for 35 years the number has been trending poorly." "I was really surprised," says Akpotaire, who is studying internal medicine. "I sent [the study] to my mom and dad immediately. You would think the conditions would be a lot different than they were in 1978." Diversity among doctors is important for patient health. People are more likely to follow doctors' directions on things like medication or exercise if they can identify with them. "If you can relate to [patients], it's a lot easier for them to feel at home and comfortable with you," he says. "It's good to see you brother!" I had never met this man, but I knew exactly what he was talking about. With a large smile on his face and a look of pride, he extended his arm to give me a handshake. "There aren't too many of us doing what you do. I'm glad we got some representation in here." "If you're a black male, let's say you're growing up in an inner-city neighborhood," he says. "There's so many things directly in front of you that you have the option to go into." The options range from music and sports to small business and church, Okorodudu says those professions are visible and present in the lives of young African-American boys. "But when you talk about the medical workforce, none of us are directly there in front of them," he says. Okorodudu decided to become a doctor when he was 18. A year from now, when he's done with his fellowship, he'll be 32. Med student Jeffrey Okonye points out that for students like him, who embraced math and science, there are much faster ways to "make it." "A lot of friends of mine, black males, are engineers," Okonye says. "They go to school for four years. They have a job, great pay, even had internships in undergrad I was highly jealous of. Whereas my route, four years undergrad, then another four years of school, and then another X amount of training after that." So why did he take the longer route? "It's hard to describe the feeling you get when you make someone actually feel better," Okonye says. "When you can see them go from one state to another and recognize that you were a part of literally changing this person's life." A desire to care for others isn't the only thing that Okonye, Akpotaire and Okorodudu have in common. All three have had doctors or nurses in their families. And all three are the children of immigrants from Nigeria. Okorodudu says that means the group of black men who are applying to medical school now is very different from the group in 1978. "In 1978, those people we're looking at, a lot of them were probably black American males" whose families had been in this country for generations, he says. Today's black medical school students may be more recent immigrants from Nigeria or the Caribbean, he says. "So if we broke it down that way, that factoid is actually even more alarming." The AAMC report suggests how to restock the doctor pipeline. Among the ideas: create more mentoring programs, expand financial aid options, and persuade medical schools to put less emphasis on standardized tests scores like the MCATs. This story is part of a reporting partnership that includes NPR, local member stations and Kaiser Health News.